PanARMENIAN.Net - Armenian Defense Minister David Tonoyan on Tuesday, January 29 met a delegation representing Russia's Kalashnikov Concern, led by CEO Andrei Baryshnikov. At the meeting in Yerevan, Tonoyan prioritized the cooperation between Armenia and the Russian company, expressing readiness to support every project aimed at contributing to the launch of joint production of military products in the country. Baryshnikov, in turn, unveiled the projects carried out with Armenian partners as part of cooperation in CSTO. In particular, he said, Royalsys Engineering and Kalashnikov Concern have agreed on the joint production of the latest models of AK-12 and AK-15 assault rifles in Armenia. 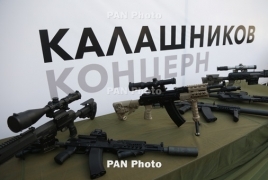 Armenia will purchase about 50 new AK-12 assault rifles from the Kalashnikov Concern, general director of the Concern Vladimir Dmitriev said earlier in an interview with Kommersant.